If done incorrectly the dumbbell fly can aggravate existing shoulder problems, tendonitis, bursitis and rounded shoulders. 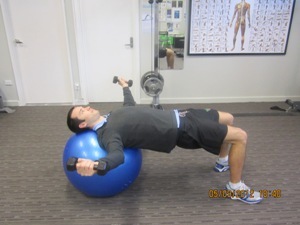 Peak Body personal trainers show clients effective methods to properly and adequately focus on the chest with specific chest exercises including pec flyes. 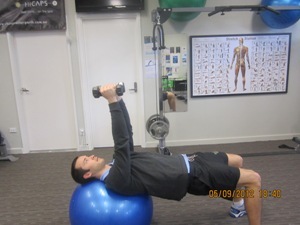 Step 1- Lie back on a fitness ball with a dumbbell in each hand. Make sure your head is in a stable position throughout the movement. Your arms should be extended above the chest and they should be slightly flexed at the elbows. Step 2- Lower the dumbbells to the side of your body without going past the level of your shoulders.